Buying a gift for a drummer is easy. Give them a skull to whack and a femur to whack it with and they'll be happy, right? Wrong. Oft labelled as 'those people who hang around with musicians,' and always carefully placed and forgotten at the back of a stage, a noble sticksman deserves a stocking stuffed with accessories more than most. Essentially, it's a drumstick with a flexible tip for super-fast playing. Don't confuse it with 'slapstick' humour, though, its manufacturers are hailing it as a serious "revolution in drumming." Purists might consider it cheating, but what the heck? If it takes us one step closer to breaking the record for beats-per-second on a ride for just $9.95 per stick, we're having one. Or two. Joey's Paiste Black Alpha cymbals are a bit too big, heavy and expensive for a stocking, but you can at least look the part. The "officially licensed" mask will set you back $34.99 and is molded from the drummer's own face. Look out for Slipknot's cover of I Wish It Could Be Halloween Everyday, coming to an imagination near you very soon. Drummers, or - even worse - idiots who think they can drum, will bang anything. Look around an office, classroom or public space and we guarantee you'll see someone banging out a rhythm on an empty surface with a pencil. This electronic drumkit t-shirt won't shut them up, but at least they'll be forced to tap themselves with realistic(ish) results. Seven drum sounds, embedded speaker and a removable battery slot for $29.99. Hooray. This is the meanest looking accessory we've seen all year. Seriously, if the Devil himself played the drums, he'd have 13 of these bad boys in a row. Pearl's Anarchy block is black synthetic wood, complete with swivel mount and spikes for $39. Did we mention it looks mean? We're not sure if nu rave can be classed as 'new', or even 'rave' anymore, but here's hoping the neon-chic it brought to indie rock remains. These are shock sensitive drumsticks stuffed with a "high-powered" LED which lights up when bashed. Available in blue, green or red and perfect for brightening up the dingiest of venues, bedrooms or illegal woodland rave locations. Yours for £14.95 per pair. 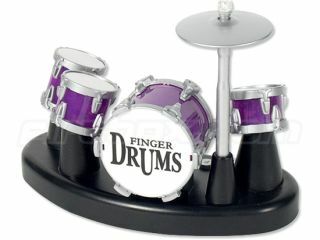 A miniature kit with touch-sensitive drums and cymbal. There's a little working bass drum pedal, and the option to record and playback your solos through an in-built speaker. A perfect gift for the executive sticksman in your life. Or, for the sanity of work colleagues the world over, an executive sticksman with his own office. A mini bargain at under a tenner. Even if you're not a fan of death metal, no drummer should be without a coffin-shaped drumstick case. Made from tough heavy black nylon with a blood-red inside pocket, they'll protect your sticks to the grave. You can even get one with a picture of Ozzy Osbourne on the front for $39.99 - not the biggest name in drumming, we must admit, but who's counting? Why bother with a real kit when these electronic sticks will emit a realistic sound on any surface. Or, even better, on thin air. Hold them tight, swing them around and change the sound from snare to tom to crash with the flick of a switch. Try Rock Beat or V-Beat sticks for £9.95 and £19.95 respectively. Oh yes, air drumming is the new air guitaring. If we were ringmasters, we might end this feature by saying something amusing like: "roll-up, roll-up for the roll-up USB drum kit, a steal at just £14.67." Unfortunately, we're not, so we'll keep it real: here's a Windows-compatible, plug-in-and-hit electronic kit. There are six sounds with adjustable tone and it's pretty-much flimsy enough to screw into a ball - a welcome break from lugging around a six-piece mahogany unit.